Stock # 11452, 3.5L V6 EFI DOHC 24V, 8-Speed Automatic, 25386 mi. 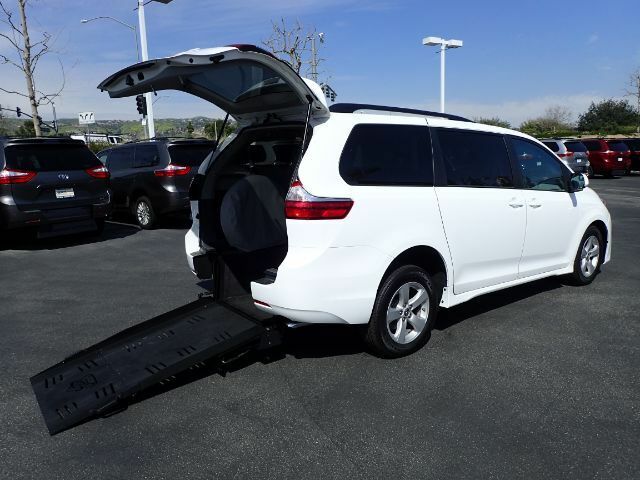 Equipped with a 34" manual spring-assisted rear-entry ramp which is a great way to own an accessible vehicle without the expensive cost of an automatic ramp. This 2018 Toyota Sienna LE has just a few miles over 25k. Able to seat seven passengers including the chair rider with the third-row fold-down bench. Beautiful bright white exterior accented by deep tinted windows pairs great with the woodgrain accented interior. This conversion is a great option for commercial or passenger transportation use. The rear ramp makes parking a breeze and without obstruction. The optional bench is great to use when the chair position is unoccupied. And the rear ramp is easily out of passenger vision being in the back of the vehicle.